Experiencing Rheumatoid Arthritis: Happy New Year! A very Happy and Blessed 2008 to y'all!! 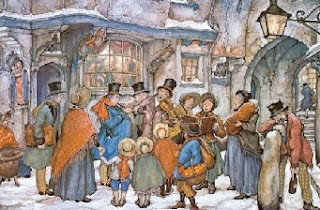 I thought I would do something different this time, therefor no picture of fireworks, but a typical painting by a very famous Dutch artist Anton Pieck. May your coming New Year be filled with lots of love, joy and happiness and may God's blessings be poured upon you in abundance. And here's to wishing you and your beautiful family all the best for 2008. MUCH LOVE!!!!! Merry Christmas and an on-time Happy New Year. Now I will put yours back on. Slowly but surely I am accomplishing this. getting enough happy birthday wishes said to him. His birthday was on the 28th. ME a mean Canadian woman!! Have a great News Years Corry. I have been keeping up with you but hadn't commented. I remembered your father in my prayers though and I hope he will recover quick and fully! Don't feel bad because I just discovered I had no link to you, while I was convinced I had! Old age setting in here. Grandpaw has more birthday wishes coming, if he would just pick up his Birthday-card! hehe. Thank Princess for spilling the beans and we will make it up to her. As for grandpaw calling you a mean Canadian woman... that's just a southern term of endearment! And I can know, since I am being called "meaner than a snake" in that same endearing manner! grin. Have a very blessed New Year, filled with lots of joy and happiness, Terry! I drop by here on New Years Eve and find a canadian lady bad mouthing me ! She just don't know what a good out standing citizen I am ? I ain't gona let princess visit her anymore cause I still ain't got all them bad ideas out of her head and that was in the summer time ! Just wanting to wish You and KC A Happy and Blessed 2008 ! Don't forget the blackeyed peas and rice and collard greens and onions soaked in vinegar with some Misissippi sweet taters and some fried sliced smoked hog jowls ? Thanks for the wishes and we wish you and yours lots of love, joy and happiness for 2008 and many, many blessings. Now as far as dinner goes... what time is it served??? hehe. just popping by to wish you a most joyous 2008 ... filled to overflowing with JESUS! Happy 2008 to you and yours! A very Happy and blessed New Year to you too! Thank you and the same to you both! May God bless you both with lots of good health this year! And to y'all as well! i'm still in one piece. hehe... holidays had been quite difficult for me lately but God is good. He'll make things beautiful i'm sure. hope things will be a lot different this time. new year... new hope. still holding on to His promises. May God bless you so much this year and may all your wishes come true! A very blessed New Year, girl. Happy New Year, and God bless you. Happy New Year to you and yours! Blessings in Christ! Thanks for you prayers concerning the home-going of my husband's great grand father! Thank you and a very Happy and blessed New Year to y'all! You are welcome and we are sorry for your loss. May God strengthen and comfort y'all and bless y'all abundantly this coming year!